Finally. 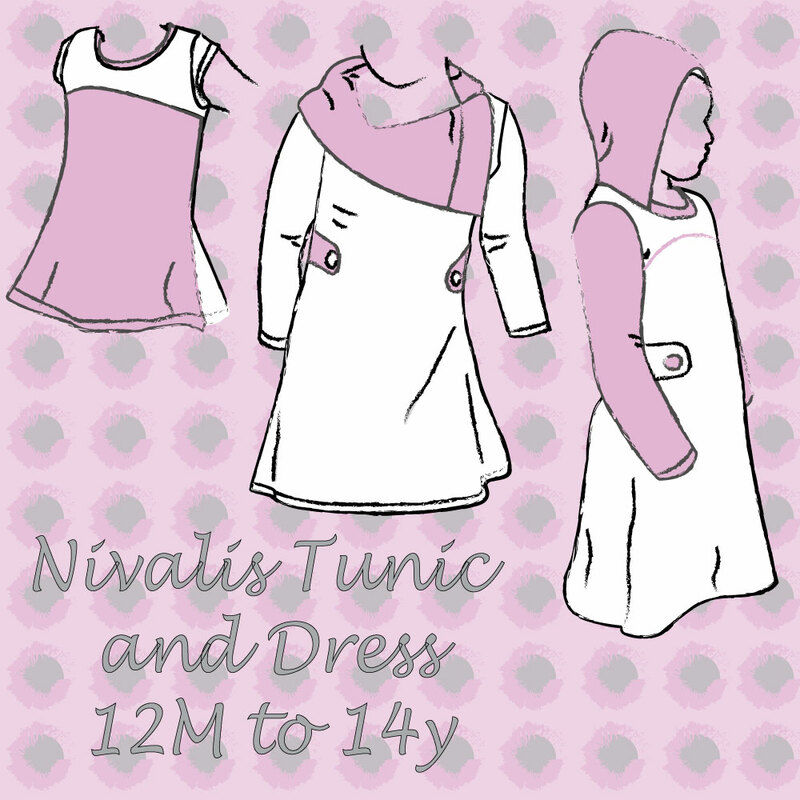 The Nivalis Tunic and Dress is released! I know a lot of you have been looking forward to this release for a long time. Sorry for all the teasing 😉 But it was worth the wait, right?! First, let’s talk about the Nivalis Tunic and Dress. Made for knit fabrics with at least 30% stretch. The dress has little to no ease, so it is slim fitted. The waistline is tapered. The waist tabs add a nice accent to the waist, visually creating a nice slim waistline. The Nivalis Tunic and Dress is flattering on all ages. Let’s show you some of our tester’s pictures. You will love it! Simple bodice, dress length, cap sleeve and hood. The hood extends only halfway around the neckline. It is not lined, but it has a hem in front. Though, it would be easy to line the hood if you prefer. Option B with collar and long sleeves. The collar can be made with or without buttons or snaps. Only the bottom 1 to 3 buttons/snaps will be functional. But closing them gives a nice lift to the collar. If you dislike buttons/snaps, you can just leave them off. The colorblock bodice is my favorite. You can choose to color block only the front or front and back. This is such a flattering feature for girls. And gives you many options to be creative. There has already been some talking in the group about making the top part out of stretch lace or creating an Elsa dress…. If you’d rather have a quick sew. The simple bodice (option A) with simple neckline is your choice. Add the cap sleeves and you will have the perfect summer dress. Play with fabrics to create fun accents. Use different sized buttons. So many great ways to create your own one of a kind Nivalis. This pattern is not only cute on the little ones. It also looks great on the bigger ladies. A perfect tunic or dress to dress up our tweens. I can go on and show you so many more pictures but I will wait untill tomorrow. Let’s give you the SALE info first. Release sales here are always short and sweet. You can now get the Nivalis Tunic and Dress for only $5 (excl. EU tax) for two days only. It will be over quickly so get your copy now before the sale is over…. Link to the Dutch version HERE. Don’t forget to join our Facebook group or tag us on Instagram when you have made your own Nivalis. We would love to see what you have created! Previous post: So far, so good…..
Next post: The Nivalis, we love it! Oh Anne! Nivalis is another WINNER! So beautiful!